Level the Playing Field. Win based on your designs not the size of your company. ExactFlat brings your business the highly useable pattern making tools you need at the right price point. Use our software to take your 3D furniture designs and convert them to 2D patterns in minutes. Eliminate even more wasted time by producing accurate fit every time. With cost-efficient flattening and pattern making, designer shops of all size can compete in a level market. With other design and pattern making products the financial barrier to entry prevents many furniture businesses from even getting a foot in the door. Not with ExactFlat. Our solutions cost less than half as much as most other products. And they’re the industry standard for fast, accurate pattern making. If you value total cost-of-ownership and want to find a way to create patterns faster than you do today, then you need to look at ExactFlat. Don’t Buy Everything. Buy What You Need. Most vendors that provide design, flattening and pattern making software will try to force you into purchasing every tool needed in the furniture making process from them—all of which will cost you substantially and leave your business limited in choices. Don’t let them pull the wool (or any other fabric) over your eyes. At ExactFlat we do one thing and we do it well. We use our software to flatten your 3D Furniture Designs into 2D patterns that fit. It’s that simple. 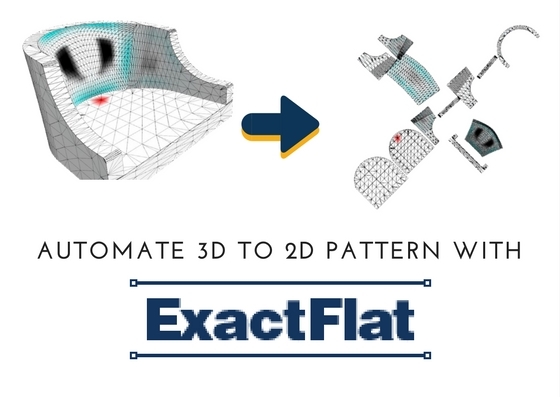 You don’t have to be a 3D CAD or flattening expert to see benefit from our ExactFlat software. All you need is a 3D design of your furniture and 10 minutes. However, we’ll never leave you hanging. ExactFlat hosts a weekly online Master Class where we share all the tips, tricks and best practices you need to continue to innovate and expand your capabilities. Our pledge is to be there if or when you need us. Cut design cycle time and production costs. Thrive with high profits on every product, including low production volume pieces.